With a 5.2% acceptance rate, Harvard University leads the pack by accepting the lowest percentage of students. Surprise, surprise. And which Ivy League college follows on Harvard’s heels? That would be Columbia University, boasting a 5.8% overall acceptance rate. Princeton University’s admission rate rounds out the top three at 6.1%. Then comes Yale University’s 6.9%, Brown University’s 8.3%, University of Pennsylvania’s 9.2%, Dartmouth College’s 10.4%, and Cornell University’s 12.5%. In the Regular Decision round, with notifications coming out yesterday, a mere 3.4% of applicants to Harvard University earned admission. By our calculus, that’s a waitlist and rejection rate of 96.6%! 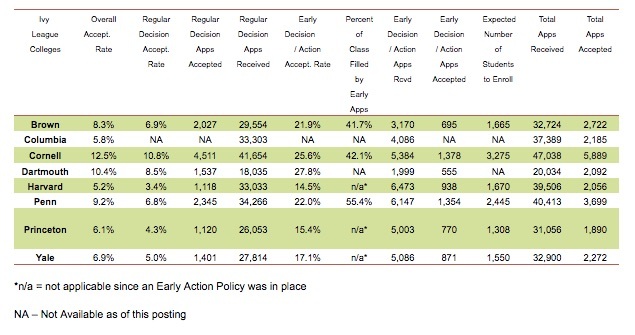 That same statistic for Princeton University this Regular Decision cycle stood at 4.3%. Yale University’s stood at 5.0%, University of Pennsylvania’s at 6.8%, Brown University’s at 6.9%, Dartmouth College’s at 8.5%, and Cornell University’s at 10.8%. But Ivy Coach, you forgot about Columbia University! As usual, Columbia isn’t releasing all the numbers. We’ll track them down — in time. And which Ivy League college received the most applications for the Class of 2021? Duh. Cornell University. Cornell is a very big school! But check back soon as we’ll update our preliminary Class of 2021 Ivy League admissions statistics with more data and analysis in the days to come.